This is a really bold and spectacular 7.3 oz, 3.7” by 1.9” by 1.4” DT every so slightly citrine quartz, from Aricuai, Brazil. His lower termination is a multi with five students partially lining it. Four of the students hang tight to his side whereas the fifth is parallel to the base and forms a portion of that termination. Sides and faces are covered with starbrary glyphs (Leo, Virgo and Cassiopeia), making him a Master Starbrary and kind of a ‘universal translator’. The facial glyphs (including a few record keepers) are more subtle and on one side, there are a number of small, squarish keys … they seem to enhance the starbrary glyphs. He would be awesome used on star altars to initiate and maintain contact with the Star Peoples. He is incredible and with energy that will light up the sky! There are a number of small, healed dings and a couple of tiny modern ones but none of any significance … he is incredible! 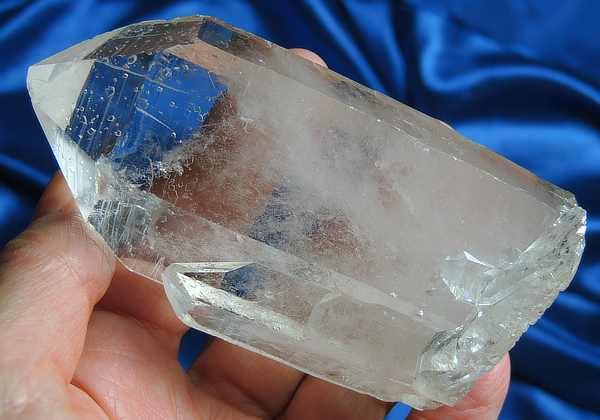 This special Spirit holds information for a special Star Seed who has seen him “before” … this Keeper will know this crystal immediately. This is also a Keeper who has a number of different starbraries and is having difficulty decoding them.